It didn’t take long to figure out what to have this week for Football Feedings. The Kansas State Wildcats were playing the Iowa State Cyclones in Farmageddon. 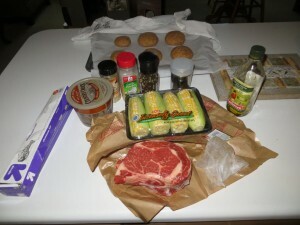 So what better way to pay tribute than to cook up some cow and corn? That’s what I did. This week we have a good ole hearty meal consisting of ribeye steak, roasted corn cob, wheat rolls, and some smoked porter to wash it down with. Here’s the recipe I used for the bread and I’m rocking the Mesquite Smoked Porter from Ranger Creek Brewing & Distilling Company. Let’s get cooking! Dissolve 1TBL brown sugar in warm water in small bowl. Add yeast and let mixture stand. Place 4 Cups flour, powdered milk, 1/3 cup brown sugar and salt in mixer and mix on speed 2 for 15 seconds. Continuing on Speed 2, gradually add yeast mixture and oil to flour mixture and mix about 1 1/2 minutes longer. Scrape bowl if necessary. Continuing on speed 2, add remaining flour 1/2 cup at a time, and mix until dough clings to hook and cleans sides of bowl, about 2 minutes. Knead on speed 2 about 2 minutes longer. Place dough in greased bowl, turn to grease top. Cover and let rise in warm, draft free place about 1 hr or until doubled in bulk. Punch down dough. 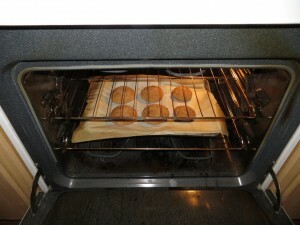 Shape dough into 6 rolls and place on greased cookie sheet. Cover and let rise in warm place 1 hr or until doubled in bulk. Bake @ 400 F for 15 min. Reduce oven to 350F and bake 30 min longer. Remove from sheet immediately and let cool on wire racks. Place olive oil in a small bowl. 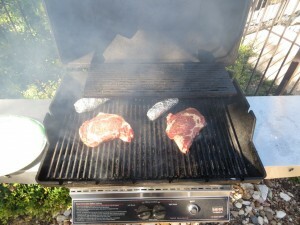 Using a basting brush, baste both steaks with the oil until they are covered. Sprinkle on the dry rub until it covers both sides. Feel free to rub it in. Wrap the steaks up tightly and let sit for 1 hour. Butter the slice of bread. Cupping the slice in your hand, apply the butter to the corn cob. Sprinkle on garlic powder, salt, and ground pepper. Wrap the cobs in aluminum foil. Get your grill up to about 300-350 degrees. Put the corn on first and let it cook for about 5 minutes. Put on the steak. Depending on the size grill each side of the steak for 5-8 minutes. Once it’s all done, serve it with the bread immediately. So how did this all turn out? Well there were some flames a coming up from the grill that caused some issues initially, but I flipped them onto the lower/medium flame side of the grill to recover. It tasted great for the wife but I wanted something a little more juicy. 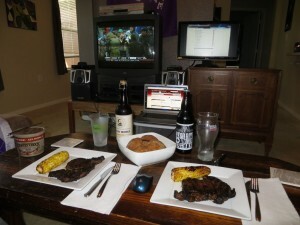 That said, the smoked porter from Ranger Creek worked magically with the steak. There’s something about a smokey, stout, porter that matches the meaty flavor coming from the steak and the rub that was on top of it. The cob corn and wheat rolls contributed nicely, with the bread being super delicious although a little flat. I paid a great tribute Saturday to my farm brothers and sisters this last weekend. You can’t go wrong with a rib eye, especially when it’s so straightforward to prepare and cook. The cob corn is just as easy. The wheat rolls took som TLC, but seeing as wheat is a grand tradition for Kansas, it was worth going through the trouble. Kansas State won Farmageddon, and the Farmageddon Feedings won me over.